It’s a long six hour drive to Banff with a hangover. wasn’t for the guys in high-vis jackets and cones we probably wouldn’t have noticed it all. It leaves us wondering how it could have ended up in there. 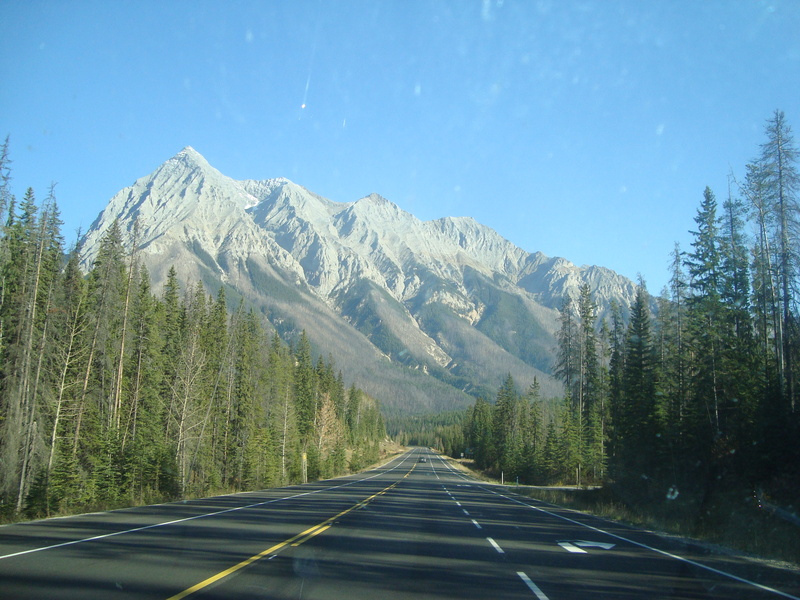 Banff is beautiful and I can see why everyone fussed about it when we told them we were going through there. 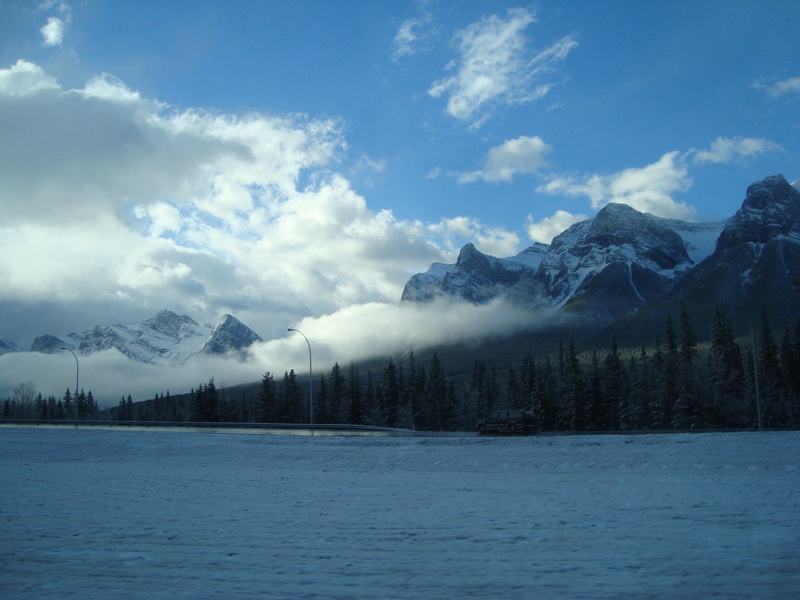 Someone even suggested we don’t go to Calgary and stay in Banff instead! However, we gotta get home somehow and the airport is in Calgary! We arrived late and found a little Holiday Lodge B&B literally thirty seconds walk from the main street. It was cheap at $65 a night and a really lovely and quaint place. There’s a hallway between our room and the kitchen and the owner – Scott Yaeger – said he shut the kitchen door once and a Korean guest spent three days in his room as he thought he wasn’t allowed into the kitchen! A quick walk around the site of an old zoo and a bridge spanning an impressive body of water and all that’s left for today is to get some food in the Old Spaghetti Factory – really good food at a decent price. Unfortunately we’re both too tired to eat it all! Our thirteenth and final day saw us leave our happy little b&b under a warm sun and cool air… and ten minutes later both sides of the highway are covered in frost. A few miles further and snow covers everything and falls heavily around us. Yep, our last 24 hours on Canadian soil and it finally frickin snows. but it might also be that all the Canadians we’ve met on our travels have told us not to bother with the place! 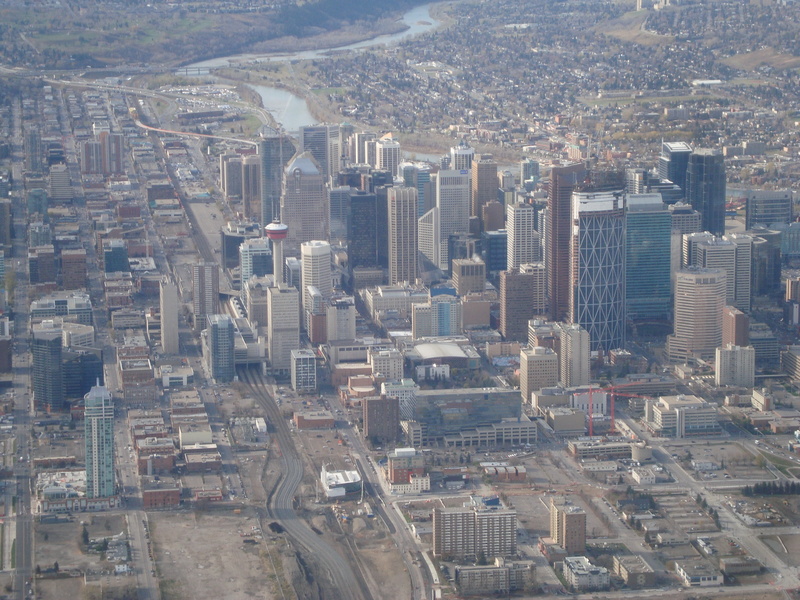 I think it’s because that Canadians in general are outdoors-loving folk, with plenty of space and wilderness around them, and Calgary might seem too busy and confined for them. Still, we’re here and determined to make our short stay as much fun as possible. 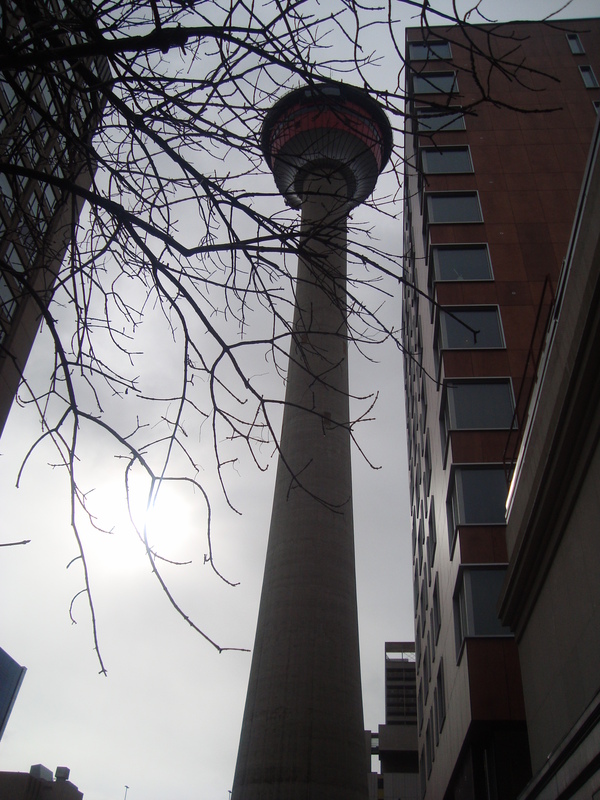 The 191 meter tall Calgary Tower is our first stop. The restaurant at it’s peak provides us with brilliant views as we chow down on very tasty pork subs and fries as the room slowly turns in a 360 degree view of the city. 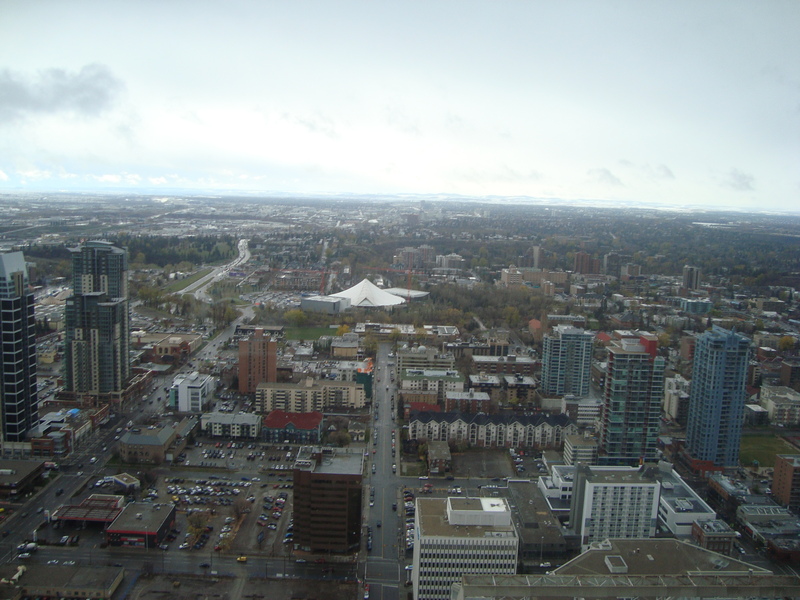 It’s a unique experience and I find myself warming to Calgary more. 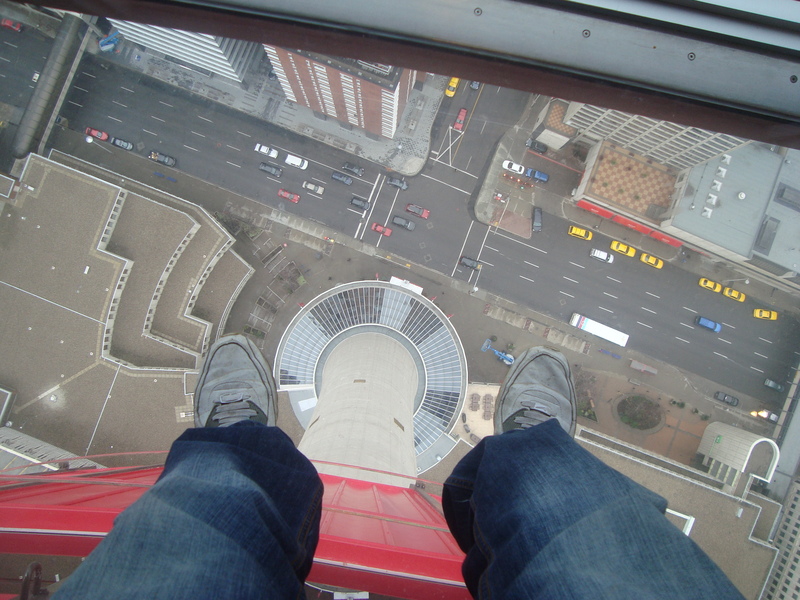 An unnerving view from the glass floor of the Tower! And suddenly it starts to snow and we’re sat up high watching the sky scrapers and buildings around us begin to disappear underneath the snowfall. More than satisfied with both the food and the view, we depart the tower for a quick walk around the streets before our next rendezvous. 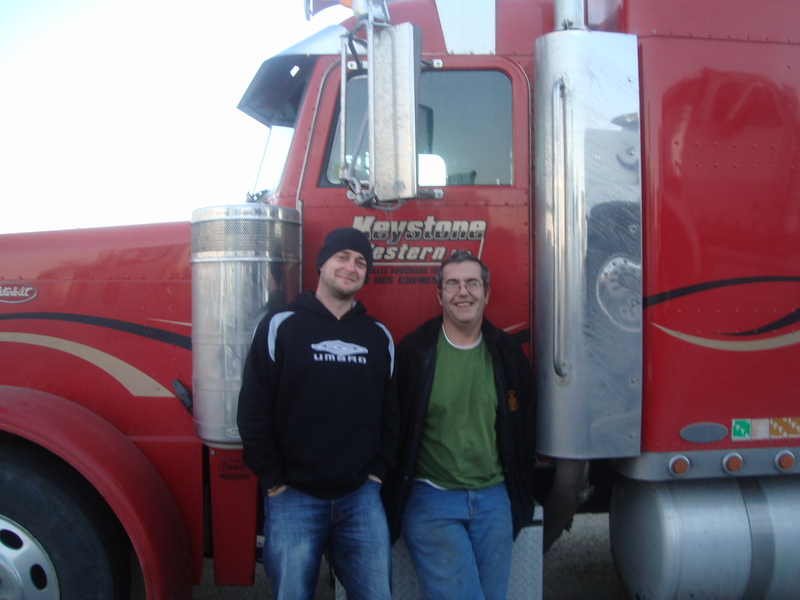 A few years ago I got my hgv licence and joined a website called www.truckersworld.co.uk where I became friends with an ex-pat trucker in Canada called Robert Menhenit – aka BobTheDog. I bugged him with Canadian questions about lifestyle and work and he always took the time out to explain and answer my queries, so when we realised we’d both be in Calgary at the same time we had to meet up! Bob’s a great guy – really laid back and has a slow drawl to his talk which is infectious. He has an opinion on everything and is very knowledgeable on a host of subjects and soon Jo’s gone back to the car to wait while we continue chatting! Evening draws in and we find a Travel Lodge to stay in before killing some time in the nearby Chinook Centre. It’s a very impressive shopping mall with unimpressive shops, but the real reason we went was to go watch Jackass 3d… but the queue was too damn long and I was getting hungry. So, we walked back to the hotel only to realise that the building next door was a steakhouse called The Keg Steakhouse! Food time, and I had possibly the greatest piece of steak I’ve ever eaten. It was called a baseball steak served with garlic mash and I’ve never wanted a meal to never end before! All tales suggested Calgary was home of the steak, and I definitely agree. Retiring to bed I flick through the Canadian tv channels and suddenly feel a pang of regret that I’m not going to be able to watch as much Robot Chicken and NFL and college football games back in the UK. It’s been a great two weeks and Canada has been amazing… and I like to think that I’ve made my mark on the second biggest country in the world as well! There will be one more Canada blog after this one; just a summary of the holiday in general before I turn my hand back to normal blogs and stop boring people with my Canadian antics. Some people have slideshows to do it, but I use blogs!